The MST AW600 MK2 is suitable for the shepherd handling a large flock (approx. 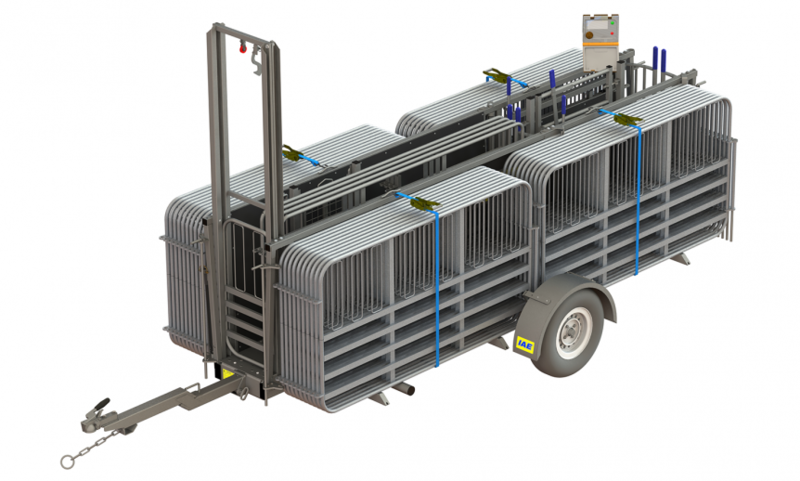 600 using an existing fence line/corner of a field) and is the ultimate sheep handling trailer manufactured by IAE. 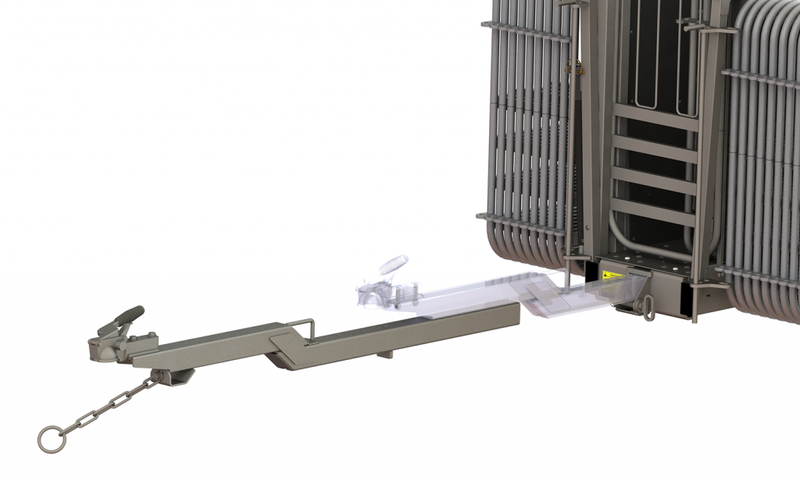 The core trailer unit of the AW600 also houses an integrated a weighing unit and is upgraded to include quick action twin gates, and dual action draft/shedding gates in the weigh unit. This system uses aluminium hurdles for weight reduction and easy handling, without compromising on strength. Excellent build quality reliably manufactured in the UK, a wealth of features and a user friendly focused concept mean that this system, ideal for anybody wanting to reduce the effort required in many of today’s shepherding tasks, is a mobile system that can go wherever the animals are and be tailored to your needs. 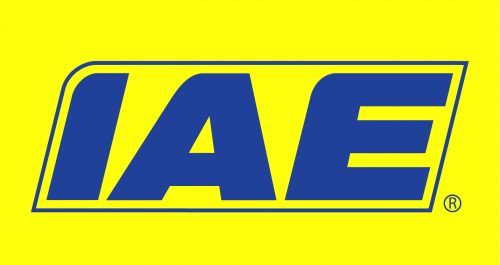 Deployment – Hydraulic pump action lifting bar means no awkward winches or cumbersome lifting frames to deal with when setting up to work or packing up to leave. Simply unhitch and rest the front of the trailer on the drawbar skid, pump to extend the lifting leg, remove the wheels then reset the pump to allow the race to gracefully descend to the operating position. Complete in a few minutes with minimal fuss. Arrange – Depending on which configuration you choose, then quickly arrange your race extension and holding pen hurdles into whichever setup you need for that day’s tasks and work can begin. Choice – At the heart of every system there is the trailer itself with a drafting system as standard. Each MST (Mobile Sheep Trailer) configuration has different capabilities but are fully interchangeable and upgrading with additional aluminium hurdles or other IAE sheep handling equipment. Weighing – the highest specification MST models feature the ability to weigh and 3-way draft. Featuring S-Link rapid action twin gates, they make this task remarkably fast and easy. At the core of all MST configurations there is the trailer itself which comes fitted with the specially designed race system and offers many excellent features and benefits. 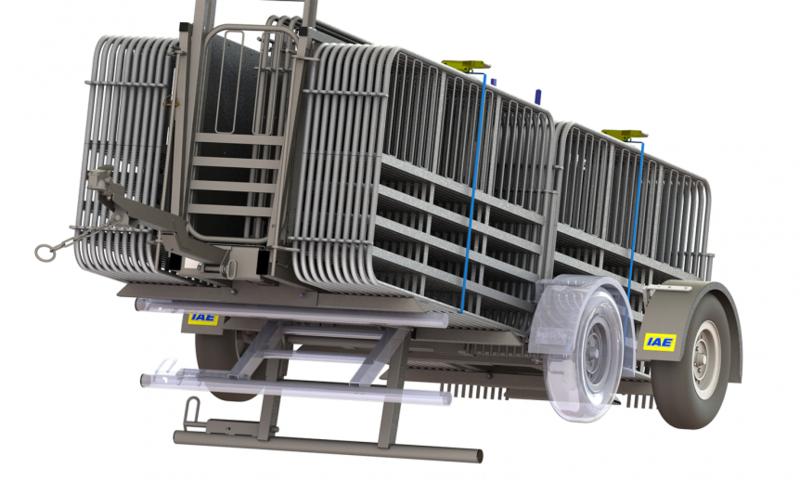 The race is extended using special 915mm high hurdles (which will stand at 1000mm high to match the other hurdles when the base of the trailer is taken into account), clad with 6mm Stockboard giving strength, bio-security and less interference with EID reading equipment. The race itself is 3.9m long and is tapered (with a 490mm maximum internal dimension). The hurdles are manufactured from 38.1mm x 38.1mm SHS for robust longevity. Each trailer configuration can be specified with either a 570mm lift and swing guillotine gate or a 915mm swing gate in frame to suit user needs. Three drop in stop gates along the race form the stopping points to control animal flow through the trailer. The front of the race features special shedding hurdles, also clad with 6mm Stockboard which enables drafting out of the front section of the trailer in 3 directions. The MST core is upgraded in the MST – AW300 and MST – AW600 to include an electronic weigh door linked to a (supplied) weighing load cell and Gallagher W210 indicator. Specially designed “S-Link” quick action twin gates are found in place of the drop in mesh gates around the drafting/weighing area, allowing swift animal ow into and out of the weight area. The drafting gates in this section are further upgraded to a special double hinged shedding design which allows drafting out of the weighing section unhindered. The MST trailers are designed for off road use only and are not certified as road legal.